Snugglebum warm was an expression my Mom always used when she wrapped us up in a billion layers and kicked us out of the house to play in the snow for awhile. According to urban dictionary, a snugglebum is a human heater – that special someone in your life that cuddles up with you to keep you warm on a cold and rainy morning. The person that will drop everything they had planned for the day and be content cuddling up with you forever. Ah, if only we could all spend our days cuddling. I think the world would be a better place. Luckily, there’s a recipe for that. 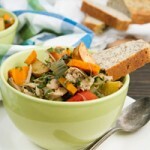 If you don’t have your own snugglebum on hand, or the thought of vegging on the couch all day doesn’t peak your interest (or is at all practical), you could just make some homemade turkey soup with that leftover turkey carcass you stuffed in the freezer after Christmas dinner last week. One serving of this soup is equal to one mega dose of snugglebum. When’s the last time your snugglebum benefited your bones? 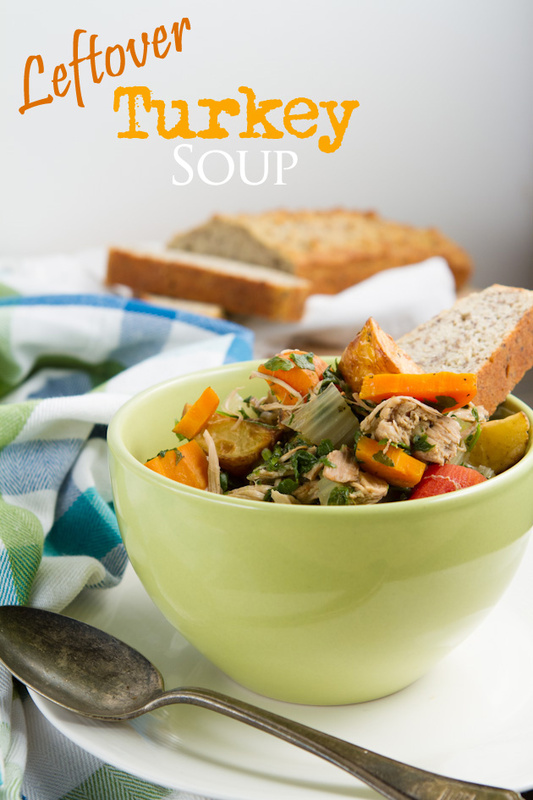 Warming turkey and vegetable soup made with minimal oils, 0 grains, and lotsa love. Remove as much meat as possible from the turkey carcass and place bones in a large stock pot. Cover with stock ingredients and bring to a boil. Skim the foam that comes to the top. As the carcass softens, push down to submerge all bones in the water. Reduce heat to low and simmer for 2-6 hours. Stirring occasionally. Once complete, pour through a strainer, place into a large bowl and refrigerate for at least 24 hours. Then, skim the fat off the top of the bowl and you're ready to rock! 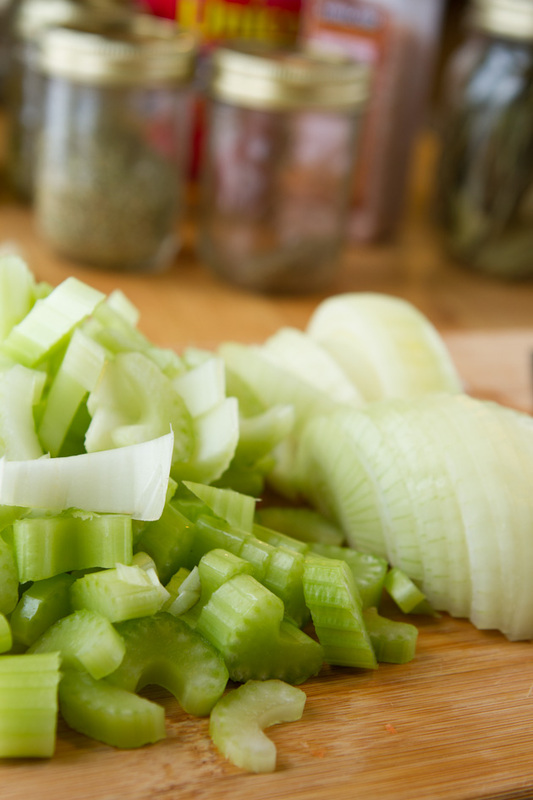 Saute oil, onion, celery and garlic in a large soup pot. 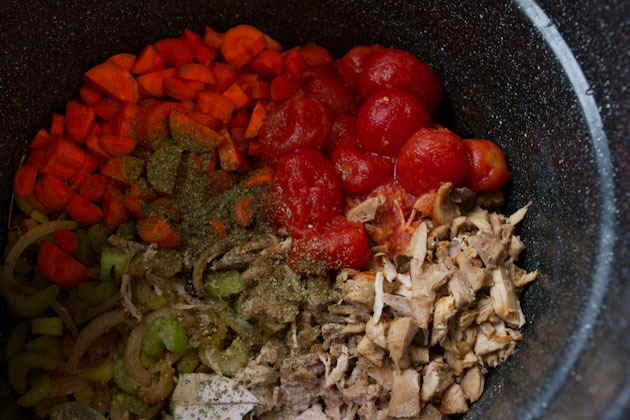 Add turkey, tomatoes, carrots, salt, bay leaves, oregano, basil, pepper, marjoram, thyme and sage. Bring to a boil and cook for 20 minutes. Meanwhile, preheat oven to 400F and combine all roasted potato ingredients on a medium-sized baking sheet. Roast the potatoes for 30 minutes, flipping halfway through. When soup is about 1 minute from completion, add in thawed chopped spinach and roasted potatoes. Remove bay leaves and serve. If you don't have a turkey carcass, no worries. 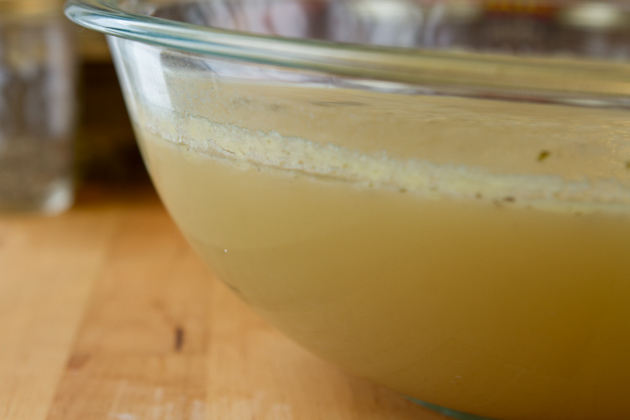 Just use 20 cups of store-bought chicken or turkey broth. Cooked turkey or chicken breast would work for this recipe, too. After being refrigerated, your stock will be quite gelatinous. This is good. The more gelatin, the easier the nutrients will be delivered to the places your body needs it most. 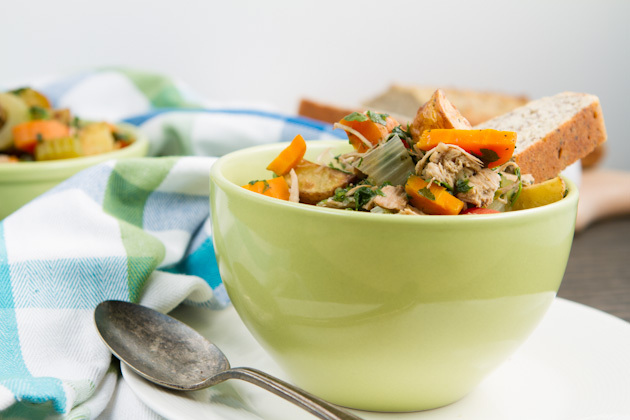 The secret to this tasty soup is in the roasted potatoes. They add so much flavor to the end result! Definitely worth it. The crispier the potato, the better. Roast those babies until they’re nice and golden brown. Add it all to a pot, bring to a boil and let it simmer for 20 minutes. 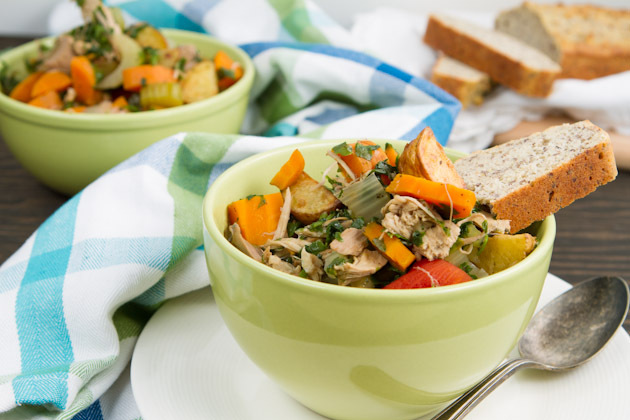 Serve with a slice of grain-free flax bread and you’re good to go!